Elon Musk’s social media activities bring chaos. His infamous tweet proclaiming that funding had been secured to take Tesla private at $420 per share—which would have valued the electric carmaker at an estimated $72 billion—landed him in hot water, resulting in a fraud investigation and adding to the downward trajectory of the company's shares. In the end, the founder caved to the demands of the Securities and Exchange Commission in the form of a reported $20 million settlement and stepping down as chairman, although he will remain CEO. Views remain split on whether this is a good thing for the company, stemming from some other ill-advised remarks. And it appears Musk hasn't learned his lesson: He called the SEC the "Shortseller Enrichment Commission" in a tweet at the beginning of the month. Whether Musk actually intended to take the company private is still debatable. However, there are several reasons to delist, from financial gain to reducing regulatory and reporting requirements, and several large companies have taken that plunge over the years. Another one could be on the way. Last week, news broke that a consortium of investors including Brookfield Property and Saudi conglomerate Olayan Group are working with the largest shareholder of Intu Properties, John Whittaker, on a potential deal to take the company private. Olayan and Whittaker own nearly 30% of the British retail property group, which would be valued at around £2.5 billion if the deal goes through. 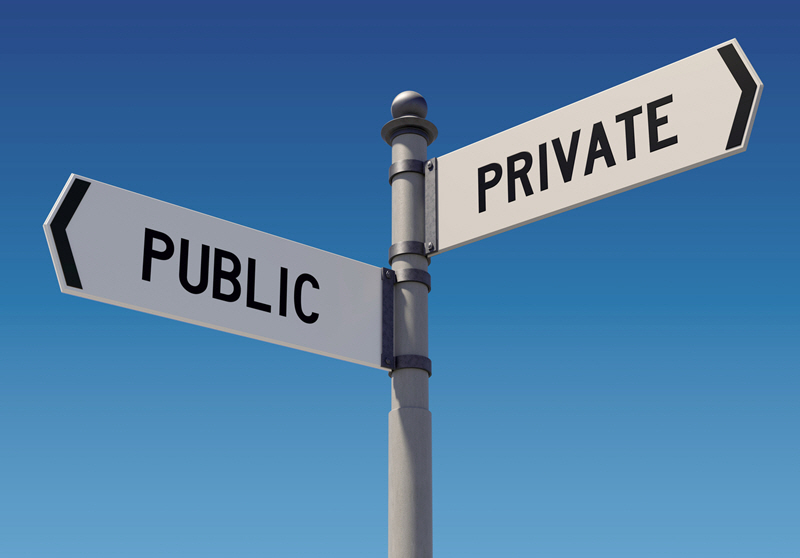 There are still companies willing to go private—although it's an option that isn't as popular as it used to be. In 2018, the quantity of global take-private deals declined markedly, and is on pace for the lowest total since 2002, per PitchBook data. It's been a little more than two years since Dell Technologies bought fellow tech giant EMC in a record-breaking deal worth $67 million, with Silver Lake providing the private equity backing (more on the connection between Silver Lake and Dell in a bit). The complicated transaction merged EMC and Dell while leaving virtualization specialist VMware, an EMC affiliate, on the public markets. Texas-based Energy Future was acquired by KKR, TPG Capital and Goldman Sachs through a $45 billion leveraged buyout in October 2007, delisting Energy Future from the New York and Chicago stock exchanges. Unfortunately for the business, all did not end well, and it filed for bankruptcy in 2014 with assets of $36.4 billion after a decline in natural gas prices. Next on the list is Equity Office Properties Trust, which Blackstone bought for $36 billion in February 2007. The deal netted Blackstone a portfolio of interests in 580 buildings across the US. At the time, this mega-transaction was the largest private equity deal in history. KKR appears again on the list with the acquisition of ecommerce company First Data in 2007 for $29 billion. The business, which processes check, debit card and credit card transactions, later relisted on the NYSE in 2015 in the largest US IPO that year, raising $2.5 billion. Berkshire Hathaway and 3G Capital bought the food conglomerate for $72.50 per share, or $23.2 billion in cash, in a deal valued at $28 billion including the assumption of debt. Two years later, in 2015, the investment firms merged Heinz with Kraft Foods, creating the fifth-largest food and beverage company in the world. The combined business had sales of more than $26.2 billion in 2017. American gaming empire Caesars Entertainment (fka Harrah’s Entertainment) was the subject of the sixth largest take-private deal of the past dozen years, with Apollo Global Management and TPG leading the leveraged buyout. Again, fate was not kind; Caesars filed for bankruptcy protection in 2015, but not before relisting in 2012. Alltel, the operator of the largest wireless network in the US, was scooped up by TPG and Goldman Sachs in a 2007 transaction valued at around $27.5 billion, or $71.50 per share. The company was then bought by Verizon in 2009 for $28.1 billion before being shipped off to AT&T four years later. Blackstone took hotel chain Hilton private in—you guessed it—2007 for $26 billion, paying $47.50 per share. During its 11-year relationship, Blackstone doubled the number of Hilton hotel rooms and took the company public again in 2013. The deal has proven very lucrative, as the firm fully exited the business this March with an estimated $14 billion in realised profits. After five years as a public company, the computer giant took the plunge back into private life in a 2013 deal worth $24.9 billion. Michael Dell invested some $700 million of his own money, with Silver Lake and Microsoft also contributing to one of the largest privatisations in the history of the tech industry. Four years later, Dell is reportedly considering a move to go public again. In another real estate-related deal, Tishman Speyer and the now-defunct Lehman Brothers led the $22.2 billion acquisition of investor Archstone-Smith, paying $60.75 per share. In 2013, AvalonBay and Equity Residential took on the company for $16 billion. Rounding off the list is a deal from across the pond. Although Europe clearly lags behind the US in terms of take-private transactions, Swiss retail pharmacy Alliance Boots' 2007 $21.8 billion acquisition by a consortium of investors including AlpInvest Partners and The Carlyle Group proves that there are still some high-profile deals taking place on the continent. Related read: What's next for European PE?